Artist Interview: Lacroy "Atlas" Nixon on How to Be Original, Taking Notice of Your Journey, and Why He's Starting a Poetry Club at Liberty University — The Listening, Inc. 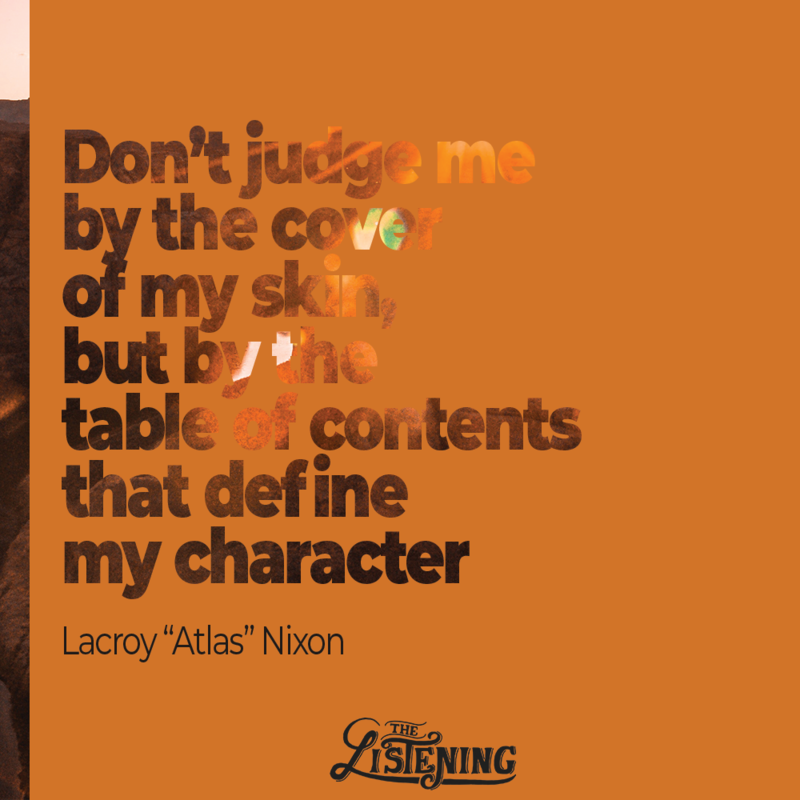 Sitting down with Lacroy “Atlas” Nixon, I was struck by the thoughtfulness of youth. Although most people reference life in hindsight, as if that is the only direction wisdom can flow, Lacroy sees his journey before him with profound clarity. It’s marked by introspection — a recurring theme in his most recent work. At The Listening, we frequently host Open Mic events that allow members of the community to share their thoughts. In this conversation, Lacroy gives us a peek into his process, as well as, the passion behind his poetry. Below is our interview, edited lightly for clarity. Danielle: Tell me a little about yourself. Lacroy: I'm a senior this year at Liberty University. Graphic Design Major. 21 going on 22... it's crazy. As far as artist stuff, I've been doing poetry consistently for about four years now. L: I kind of got put on a platform then. But, I didn't take time out of my day to write. People would just say, "We're doing this event and we'd like you to perform there." I didn't start writing consistently until I got to college. There is a group, Bridging the Gap Urban Ministries. They have an artist development program. The guy who was running it at the time, he found that I did writing. So, he was like, "Oh, so you are a poet." I felt like that was stretching it a little bit. Basically, in a twist of magic, because God has a rare sense of humor, it was a Listening event that was my first ever event with them. That was my "debut" event. Before that I didn't perform consistently. It was in Fall 2015 when The Listening had their event on the steps of DeMoss Hall. That was when I had just joined the group. I was nervous. I get up there and do it. I think it was Jerry Griffin that came up to me after and said, "Hey, we're having another event downtown. We want to know if you can be a part of that." (Me being me) I'm like, well... if I'm going to do this artist thing, why not? It's pretty much been on and up since. L: Originally, Charlotte, North Carolina. But, I was raised in Williamsburg, Virginia. D: And how did you end up in Lynchburg? L: Actually, it's funny. When I was in high school, all four years, I ran track. When I was picking my college, I was like, "Wherever I go, I want to be able to make the track team." My whole plan for college was that I would get my Engineering degree and run on the track team or the football team. I thought I would just be in my own little corner — little world. That's how it's going to be. I get here and I found that they have a pretty good track team and engineering program. They accept me. I'm like, "You know what? I might as well come here." Because I had gone to the state championship and on the old indoor track in Green Hall. I had seen some of the campus. I came here and I was on the track team for about two years. Then, they were like, "We need people that can leap tall buildings in a single bound. And you can only leap medium buildings in a single bound. You can't be on the team." Then, engineering... it was great until I got to the middle. A lot of people didn't make it through. I was kind of down about it at first. Then, I realized that it's hard. It's OK.
After a while it was like, "Now what?" D: Tell me about the name "Atlas." L: Bridging the Gap Urban Ministries has everyone go through a three week process. It's a spiritual, physical, and mental process. It challenges you on all sides. It's really good. A lot of people come out a better person altogether. But, I go through this process and at the end of it there was a big show. You showcase your skills and at the end of the show you get a name. It's a tradition that they've kept going for a long time. For me, they named me "Atlas" because I held up my team. I kept people motivated when nobody else wanted to do anything. It stuck because there were a decent amount of people at the party we had. As an artist, I needed an artist name. It just worked. I stuck with it because a lot of the things I've done, I find myself, you know, by myself. I'll start off with 10 and by the end of it, there's two of us. Out of the two, I'm the one giving the energy. D: How did you end up at the recent Alright event? L: I had heard about it and I wanted to get more into the off campus events anyway. I wanted to do more in Lynchburg. I knew a couple of people who were there, like Jiggy M. I felt like I was missing out. I got a chance to get out there finally. Jiggy asked me to go first to set the tone. I was like, " I can't miss this." D: Tell me about your process. L: I'm a simple creature. I start with the concept which will literally be walking down the street, headphones in, getting ready to go to class or something. A process that I did for a piece a while back. I was thinking about, how much of a journey college had been. I was like, "Walk a mile in my shoes, huh?" But, then, the tagline came. I remember when my shoes were cleaner. It was a reminiscent kind of thing. I made this whole piece, built around that tagline. Typically, my process starts with a concept but then, out of the concept will come even the punchline. Just that catchy, almost chorus-like tagline. D: You almost start at the end. L: Yeah, it kind of builds itself around that — if you have a common theme, like for the shoes. This piece is called, "When my shoes were cleaner." So, the whole thing was about my journey but, through my shoes. Lines like, "I remember when my shoes were cleaner when my soul had koinonia with the soles of my Adidas." It was like all these shoe references from pop culture. People enjoyed that. So, I was like, "How can I make this better?" What I did was I wrote this piece and it was about shoes that I actually had. So, I would show up to events with a duffel bag. People would be like, "What's in the duffel bag?" I'm like, "You just have to find out." I'd get on stage with this duffel bag. People were looking at me like, "Yo, who is this dude?" At the time, I was on the track team and it worked. I just have this thing where "I just tryna track spike, practice what I preach." And I would pull out a track spike. I would just set it there. People were like, "Whoa." I was talking to my friends after and they explained no one had ever seen anything like that. That's why it stuck. My process is: I get the concept and it builds itself around the punchline or the tagline. Then, everything else fills in. I did a piece for Black History Month called "We got some explaining to do." It's about me having a conversation with Uncle Sam. But, you don't realize it's Uncle Sam until the end. I go to his house and it's like, "The house built on the heavy whispers of Greek neighbors from down the street. Still has the zesty tang of foreign flavor idolatry." In this piece, I'm painting the image. Building up to talking about the family issues. It's like, "You talking about how you're my uncle but, you stole me from my mother-land." After a while, once you get the concept and the tagline, everything just falls into place. D: You made reference to being a preacher's kid, and when I'm listening to you explain your process, there are lot of faith influences in there. Have you ever thought about that connection? L: Of course. My dad pastored a small church in Williamsburg since I was five. I remember because I turned five and we were moving in. For me, that was my life. That's all I was allowed to know, truth be told. It was like clockwork. Go to Wednesday Night service. Go to Sunday Morning Service. Eventually, go to Thursday night rehearsal for praise and worship. I learned how to play the drums so, every now and then I would help out. For me as a kid, I would be like, "I just want to go to the kid’s church." But, at one point we didn't have a youth minister. So, all the kids would sit in the service. As a kid, you don't realize you're getting poured into. But, then, as you get older and the same things you heard start to spew out of you — whether you realize it or not. Most kids go home and it's different. I'd go home and get the same stuff. Eventually, it's like, I knew where it was coming from. D: Books. Music. Movies. Pick one. L: A lot of movies are just rehashes of books. So, I'll have to pick music. D: Who would you be flattered to be compared to? L: When it comes to music, as a poet, I'd love to be compared to somebody like Langston Hughes. He can pack so much into one sentence. Using what most would consider to be simple language. You have to read it a few times to realize, things have three different meanings in one sentence. In a modern sense, probably Propaganda. He's been somebody I really look up to. D: Back to Langston, he really talked a lot about the government. You, in your pieces, have done that too. Could you elaborate on that for me? L: I have a piece called, "Mr. System." People reference, "The system." That it's not something that is written on paper. It's not a law that somebody has to do things this way. However, because of the way the culture works, because of the way the laws are interpreted, a lot of times, it creates this ghost or skeleton of what most would consider the system. For example, things like the prison to school pipeline. Things like mass incarceration and how it mostly affects one group of people over every body else. It's not really a written law. That piece is me talking to this guy, Mr. System. The system will tell you you're supposed to be like this. Because you come from this household that makes X amount of dollars, the likelihood of you going from here to here just because you want to is very little to none. Just because that is the way things work. Because I'm the system. It's one of those things that is unwritten but, very much present. You can feel it. For me, my writing is less about the government and more about the church's reaction to the government — that kind of intersection. There is a point to where we must ask, how much is too much? How the hierarchy of the church addresses different issues. Or how it says yes to this but no to this. Or we'll talk about this but we're going to leave that over there. D: It does seem like whoever has the least amount of power is also expected to do the most to fix the system. So, talk to me about Propaganda a little bit. L: I remember the first piece I saw by him. It was "The Gospel." He basically just went through the story. But, he broke it down letter by letter to make an acronym. I was like, first off, that is super creative. Second, he has this attitude about him. He's not going to stuff his ideas down your throat but, if you want something to eat you better come get a fork. And eat for yourself. That was the first time I'd seen him. Over the years, I had tried to pay attention to his stuff. It's the same kind of attitude. I was like, that is so dope. That line didn't match with the whole flow that he was going with. The way he delivered it, he had a little neck roll and a slant motion to his eyes. It was an attitude of "We ‘bout it over here." All of his stuff may not have a direct rhyme. His stuff is so free verse, as you'd say. He does not force it as all. But, it comes through just as hard. Just as potent. D: He's really a modern day prophet. L: In a lot of cases, yes. In a lot of cases. D: If you could make everybody listen to something, what would it be? L: All of the stuff by Masego. The dude is talented. He has a great voice. His attitude, from what I can hear in his songs, it just vibin'. I haven't heard anybody that does what he does. D: What's next for you? Are you working on anything right now? L: Of course. I'm always trying to work on some new stuff. When I first started, every week I was pumping out a new piece. Now, I work on five pieces at once. Then, I leave them all alone for 3 weeks. I'll get the inspiration and figure out how to finish one of them. It will be like, "This is what I'm going with for right now." I circulate them for performances. Right now, I'm working on a few. D: Are there any themes you are focusing on lately? Asking myself a lot of the tough questions. Then, writing about it. I've learned that when you really talk about the real stuff, from your perspective, that is what seems to resonate with crowds even more. People can see themselves in it. D: Which is always the opposite of what you think. You assume if you take big swings at big issues, that will be what's relatable. However, it's the specific stuff that resonates. So, that takes a lot of confidence. Do you think you could have done that at the beginning of your career? L: I could have tried. It wouldn't have been — it probably wouldn't have been as potent. A lot of times, you try to do it but, it's a cookie-cutter version. It's not as open and raw. With a lot of the pieces I'm going through now, it's different. I'm in my fourth year of college. I'm going to graduate next spring. A lot of the things I've walked through, I can say I'm a different person than I was when I first walked into college. It's been a metamorphosis. Today, it was funny because I was listening to a lot of my old stuff. I was like, I've really changed. I ask myself, "What is it to be Lacroy in 2019?" D: How are you using poetry outside of the stage? L: I'm starting a poetry club on campus. I didn't realize it but, there is no other club like that on campus. I want to give people a different opportunity to express themselves. I would love to have a poetry slam team, if we can get enough people in it. It would be a way to give something back. If you enjoyed this conversation with Lacroy, you can find more of his work on Instagram and on his YouTube channel. Additional Credit: The cover image “Open Book” was created by Lacroy “Atlas” Nixon.